I had the great pleasure of attending a town hall type meeting in the cool GRid70 building in downtown Grand Rapids, Michigan last night. Neither rain, nor sleet, nor even intermittent tornado sirens kept us from our appointed meeting. The tornados thankfully never materialed, but what did was a very informative meeting on the Maker Faire and “making”. Funny that I wound up being there at all, as I wouldn’t have known of it, had my good friend, Nicola Brown of Ireland, not informed me of it. Isnt that funny? Nicola, all the way across the ocean, letting me know of something really cool in my own backyard. Anyway, we began the meeting by introducing ourselves and giving a little information about what we “make”. Well, have you ever heard of a fiber artist of any sort (or any kind of “maker”) who didn’t want to share what they do??? Not likely! I explained that I was a feltmaker, with a good friend in Ireland who had given me the heads-up on the meeting. What a chuckle that received. But truly, the internet is a wonderful place to connect with others, especially if you have a shared passion, such as feltmaking. So thank you Nicola for the information on this meeting, and oh, by the way, you and I were mentioned by Matthew Gryczan (writer and inventor) in today’s Sci Tech Communications blog. Just click to read. Anyway, back to last night’s meeting…The speaker was none-other than the visionary Make Magazine and Maker Faire founder, Dale Dougherty. Dale said he’s fascinated with where ideas come from and how they are developed. One of the things that you immediately notice about Dale is his enthusiasm and zest for living and profound interest in “making”. He brought up at last night’s meeting the strong emphasis on testing in the schools, resulting in less time for hands-on learning. Not a lot of time for “making”, learning how things are made, what makes them work, and just as important, the joy of “making”. Hmmmm…What about we hands-on learners? Well, partly in response to this, Dale launched the first Maker Faire in 2006 in San Mateo, CA. Last year, Dougherty brought it to New York, and also to The Henry Ford in Dearborn, MI, attracting over 18,000 people for the Detroit Maker Faire. Maker Faire will be back to The Henry Ford on July 30-31, 2011. If you live anywhere in the area, or want to take a cool vacation, be sure to check it out. Either apply as a “maker”, or come and enjoy all things “made”…Be it arts, crafts, engineering, food, music, science, etc., you’ll likely find it there. One of the things that Dale mentioned that really struck a chord with me, was that one does not need to be perfect in order to create, and that creation comes in many forms…music, art, robotics, cooking, feltmaking…Well, the possibilities truly are endless. If you enjoy it, or think that you might…Just do it (hey, that would make a great slogan)! If you like to sing…Then by all means, do…You needn’t have the voice of Celine Dion in order to make music. Why, you’ll never know what you might find that you have a real passion for if you don’t give it a whirl. We really do have a need to create … So, what are you making? Be sure to leave a comment below and let me know. Me, I’ve been working on nuno-felted scarves for the past couple of weeks in anticipation of my class on Saturday at the Kalamazoo Institute of Arts. If you’re in the area and looking for something fun and creative to do, be sure to check the Kalamazoo Institute of Arts website. Nuno-felt scarves are the perfect accessory for Spring and Summer…Lightweight, airy, and lovely. Lots of different design possibilities, so no two are ever the same, and hey, you’ll be creating, which is a good thing. Another of Middleton’s favorite hat designers is the London-based Irish milliner, Philip Treacy, who is designing headwear for Kate’s bridal party. While I’m sure that the below won’t be one of Treacy’s designs for the wedding, it is most creative and pure whimsy. I love teaching felt hat-making and have another class scheduled for October 14 and 15, 2011 at the fabulous Judith M Hats and Supplies, in LaGrange, Indiana. For those of you not able to make that class, a favorite resource of mine, the book, Fabulous Felt Hats: Dazzling Designs from Handmade Felt by Chad Alice Hagen. 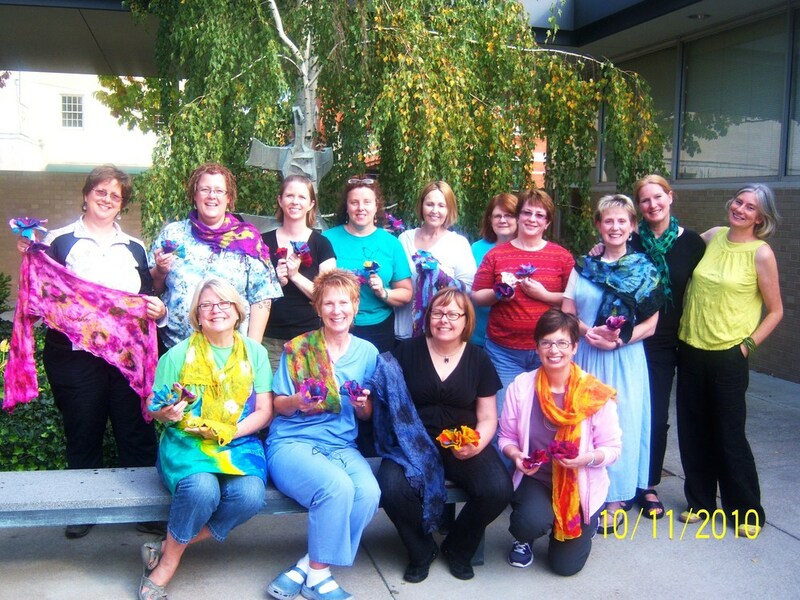 I had the great pleasure of meeting and taking Chad’s “Airy Fairy Scarf” class last summer at Jone Rakoski’s Creative Felt Gathering (CFG), which was truly a wonderful experience. Chad is an excellent teacher, funny, thorough, and a legend in the feltmaking world. Here’s a picture of one of the two hats that I made in Elis’ class, and modeled by Elis’ lovely daughter, Rachel, who modeled all of our creations without one ounce of wincing! Thank you dear Rachel. Rachel also has a great I-pod full of really cool music. I felt like a teenager again listening to late night music in the studio. Lastly, one final hat of mine, this one photographed by my talented son, Ryan, of Ryan Lindsey Photography. If you live in the West Michigan area and need a great photographer, one who is very patient, and who has a great eye, be sure to get in touch with him…Tell him his mom sent you. This photo is an image that appeared in 1000 Artisan Textiles by Sandra Salamony and Gina M. Brown. Well, that’s all for this evening…Here’s to hats, felt, friends and family. Good morning all…Hey, I’m liking this blogging thing…So easy, especially when I’m borrowing Nicola’s blog wording;-))) I’m just going to re-post her blog from April 6, 2011, so that the Workshop details and materials list are all posted here for your convenience. Have a great day all. Perhaps tomorrow, I’ll actually come up with my very own post…Stay tuned. Thank you Nicola for helping to make this blogging a piece of cake…Hmmmm…sounds good. American workshops – a guide to the raw materials required by participants! My flights are booked, new linen trousers purchased and I am SO excited now about my upcoming workshops in America, meeting old friends, making new ones and simply having the best of fun with like minded fibre nuts!!! From 13th to 16th May I will be participating and teaching at The Tin Thimble’s wonderful Mother’s Day Fiber Retreat, on Friday 20th and Saturday 21st May I will be with my amazing friend Dawn for two days of workshops in Plainwell, MI and then on Friday 27th and Saturday 28th May I will be meeting and staying with online fibre friend Jan Durham and facilitating two days of workshops in Lexington KY, how fantastic is that for an adgenda??? On the Friday participants in both MI and in KY have the option of taking a workshop titled ‘Simple vessels, purses and other three dimensional objects incorporating found objects’ and on the Saturday a workshop titled‘Nuno mosaic and other interesting possibilities for wearable felt accessories’. Participants attending both workshops have the option of designing and felting larger and more complex vessels, bags, sculptural items, bigger nuno projects or indeed an art piece for the wall. As a result I have been toying with the correct materials list to publish for each workshop, eventually I have decided to provide a ‘minimum fabric and fibre requirement’ list for some of the projects participants may want to make and hopefully this will cover most potential eventualities! In this way each individual participant will decide for themselves what exactly they want to make and what materials then need to bring with them at a minimum,. I know from personal experience that I can never bring too much fibre and embellishment items with me when I attend any workshop so limiting myself can be a challenge, it may also bring unexpected rewards at times!!! Each participant will need to bring their usual felting equipment, bubble wrap, towels (please bring a few! ), hard olive oil/goats milk/glycerine soap, sprinkler, bamboo blind, pool noodle, net, whatever they like to work with themselves. Anyone felting a bag, vessel or any sort of three dimensional project will need some flexible plastic to use as a template/resist, I prefer laminate floor underlay but in an emergency we can use bubble wrap or whatever flexible plastic you have to hand. For participants felting nuno mosaic or large nuno wraps it is really best to have two long lengths of bubble wrap bigger than the starting size of the silk used, plastic trash can liners are OK too in an emergency so if you have a roll of them please just bring them along! NB I love working with batts but roving and tops are perfect too, bring whatever you have and like to work with yourself. I will also be bringing loads of embellishments, inclusions, leather off cuts and artificial glittery fabrics with me for everyone to share as well as some of the mohair waste which I am currently experimenting with in some of my three dimensional work! Enough of the waffle, hopefully the following will be a guideline and I am always happy to answer any questions directly so please feel free to email me if you have a major concern ……. Clutch bag, vessel, iPad cover and smaller three dimensional items will need 80 – 150g of fibre. Larger and more complex bags will need 200 – 350g fibre, I like this to be divided into 2/3 merino and 1/3 a strong coarser fibre such as C1 or Icelandic wool. A nuno scarf will need either a pre rolled silk chiffon or ponge silk scarf as a base, a long length of silk cut from a roll or alternatively a cotton cheesecloth or muslin length, the longer the better in all cases! This project won’t need anything like a big amount of fibre but at a rough guide anything between 40 – 60g will be fine for a highly textured end result! A large nuno wrap (two day project!) will need 2 – 3 m (yards is fine) silk chiffon, ponge silk, cheesecloth or muslin for the base and 40 – 100g good quality merino depending on size. A mosaic nuno scarf will need a total minimum of 1m silk chiffon but this needs to be in at least 3 colours ie. 1/3m from a roll of three different colours, adding a small amount of a clashing colour can work wonders! Incorporating vintage scarves into nuno mosaic is wonderfully effective and a beautiful way of bringing old fabrics back to new life, to see what I mean check out Marni’s wonderful scarf from last year’s Tin Thimble workshop, isn’t it beautiful? These scarves will also need over 100g good quality merino preferrably in two colours. A large nuno mosaic wrap will need 2 – 3m silk fabric in mixed colours and a total of up to or over 200g good quality merino, again two colours of fibre is ideal. As you can imagine different projects require different techniques and heaviness of hand when laying out the fibre. The figures above are a minimum guideline, I don’t want anyone to feel pressurised to buy more fabric or fibre than they may realistically need but to be honest where felting is concerned, can one ever have enough fibre or raw materials??? You are currently browsing the Feltsoright's Blog blog archives for April, 2011.